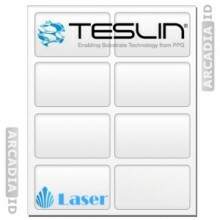 Artisyn® and Teslin® papers are the key to creating PVC card quality identification cards. 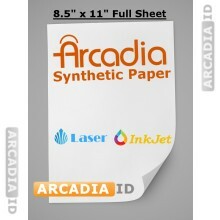 Artisyn® and Teslin® papers are silica-based synthetic printing sheets designed to absorb and bind irreversibly to ink, creating a printed image that is high definition, durable, and waterproof. 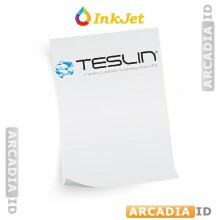 ID templates are printed onto the Teslin® paper or Artisyn® paper, using any common inkjet or laser desktop printer. The ID is punched out and placed into a butterfly pouch. The lamination process causes the Teslin® synthetic sheet to stiffen and bind tightly with the plastic butterfly pouch forming a stiff PVC card quality ID card. Laminated ID cards using Artisyn® or Teslin® paper and butterfly pouches are able to be edge to edge, without a plastic seem like normal laminating pouches and card stock. The Teslin® insert can run all the way to the edge of the card because it is waterproof, and because its high bond strength prevents delamination. It is this unique property of Teslin® paper that makes our Teslin® ID cards nearly identical to professionally printed PVC cards.